Don't be put off by the work involved here. Make a big batch and it will keep for upto 5 days in the fridge. 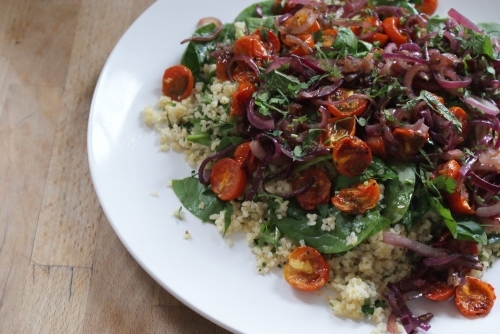 A great summer salad, a perfect accompaniment to a mezze type affair, try a simple carrot salad, some hummus and flatbreads. Feel free to substitute couscous for the bulghar wheat. Preheat the oven to 180C. Slice the tomatoes in half and throw onto a large baking tray. Drizzle with olive, season with crunchy flakes of sea salt, a twist of black pepper and a pinch of brown sugar. Stir well, making sure all the tomatoes are cut side up and roast for 40mins until shrivelled and golden. Meanwhile pour the bulghar wheat into a saucepan that has a lid with ½tsp of bouillon if you have it or a pinch of salt. Cover with boiling water, bring to the boil, cover and simmer until all the water is absorbed and the bulghar is tender but still with some bite (you may need to add a little extra water or drain any excess off). Heat a large frying pan with 2tbsp olive oil, add the onions and cook on low until completely soft. Add the balsamic vinegar, sugar and plenty of seasoning and cook for another 5mins or so until dark, sweet and sticky. To assemble the salad, squeeze the lemon juice over the bulghar and add 2-3tbsp olive oil, the garlic and most of the mint and parsley. Stir well and season to taste. Fold in the spinach and tumble onto a large serving platter. Top with roasted tomatoes, onions and the rest of the herbs.